What was it, like a week ago, that I said--just to remind you that I don't need to be reminded that I said it--that Christopher Nolan is the best film maker in Hollywood, and whatever he is going to do is going to be the very best it can possibly be and there is no finer film maker in Hollywood right now. I stand by that. There was a rumor, which was, the Batman-Superman film was actually going to be a,... gulp,.... Batman against Superman film, super-hero against super-hero. I mean, it's one thing to see Tony Stark fighting Thor, or arguing with Captain America, but we know they are going to overcome their differences and unite together for perfect harmony. In all the anti-Affleck noise, there has been little news or definite development strategies revealed, only that Batman is going to be completely re-worked (I guess from what Nolan-Bale collaboration?). Well, how much re-working can Batman take, and still be Batman? We just saw this with the "updated" The Lone Ranger: can a Lone Ranger really be a hero who considers the Constitution as a vehicle protecting upper-class thieves (please see A Bad Trade: The Lone Ranger & Re-Writing History for more). IF Nolan and director Zach Snyder want to do a Batman vs Superman film, and they want to cast Batman as a bad guy, then Affleck would be a good choice which obviously resonates with people who don't think he should play the super-hero; there are also rumors, however, that Lex Luther (originally portrayed by Gene Hackman) is being cast and will have a part in the film's plot, so how many bad guys will there be? Again, these are rumors, but if the film makers want to halt some of the bad publicity the film is all ready getting, they might try being up-front with us about what they intend to do with a great American hero like Batman, or face an even more disastrous reception than The Lone Ranger. Ben Affleck is a fine actor. He has achieved the status I wouldn't even grant Steven Spielberg nowadays: a fine director who loves and respects the art of film making. Argo was such a well-crafted film, I would not have been surprised had the Academy nominated Ben for an acting award; I was thoroughly impressed with the technicals and artistry of this exceedingly well-crafted film (please see Fear & Cowardice: Argo for more) and was surprised Ben wasn't nominated in the director's category, either. In short, his understanding of film tools, tricks and the purpose of film as art is only slightly short of Alfred Hitchcock and other such monumental film makers and directors. 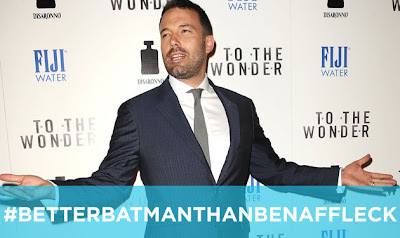 There are two sides to the Ben Affleck-as-Batman argument: those who think Ben will make a lousy Batman, and those who don't think Ben deserves to play Batman; I belong to the later group. Ben has dramatically advanced his acting skills and, let's face it, he's a handsome guy: with a great face and dark, masculine features, he might look good in the outfit; I would be perfectly willing to give Ben that fair chance to prove himself if it weren't for his own free will choosing to hate America, Americans, and intentionally try to sabotage our standing in the world. He has his free will to believe what he wants, and the Constitution to protect that free will and his beliefs, but he has not earned the right to portray a great American hero who loves and protects America because of the political statements not-so-thinly encoded in his major achievement, Argo. From that film, we can confidently deduce that Affleck hates America, and from Butter, the last film his wife Jennifer Gardner made, we can deduce they probably hate Americans, too, because what husband in his right mind would let his wife make such a utterly degrading film, mocking such a wide portion of America, if he didn't agree with it? The film was so scandalously full of hate and meanness, I had to stop it after just ten minutes because I couldn't bear to watch anymore. He is free to believe these things and hate America, but he isn't free of the consequences of his choice to hate America, and his ultra-liberal politics will prohibit the audience from suspending disbelief and enter into the world of the super-hero which--at its essence--is a stage deliberately meant to celebrate America as a super-power, not apologize for us. I fully believe in Christopher Nolan, I fully believe in Superman, I fully believe in Batman but I don't believe in Ben Affleck at all. To a large degree, these are my personal opinions, and I want you to be aware that I have my own biases which may conflict with your beliefs, but Ben being cast as Batman has obviously caused an uproar in the film world and it's worth our time to consider why because this is slated to be a massive project, with great expense and hopes for huge profits.